Christopher James are part of RSC's recycle team. 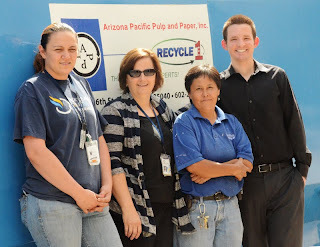 Rio Salado College recently kicked off a new recycling program in collaboration with the Recycle 1 family of companies. Participation in the new program allows the college to be paid by the ton for recycled materials. Rio Salado installed a cardboard baler and a compactor at its Tempe headquarters to improve collection capacity. Recyclable waste from satellite locations will be transported to the main location by the maintenance and operations team. The new recycling program will reduce the need to separate materials by using a single stream collection method. This method has been shown to increase participation in the program by simplifying the recycling process. Acceptable materials for the single stream method include paper, plastic, aluminum and steel. Cardboard is baled separately and not included in the single stream method. Cardboard is, however, discarded in the same area as other recycled materials Glass is also included in recycling efforts but must be separated from other materials. Employees and community members are also encouraged to bring recyclable materials from home to the college for disposal. Drop off hours are Monday – Friday, 7:00am-9:00am. When recycling, it is important to rinse beverage and food containers and be aware of what materials will not be accepted. Recycle 1 staff will be available to answer questions about the program during the 2013 Rio Salado College Earth Day celebration. Planned activities include an electric car showcase, document shredding, E-waste collection, and picnic lunch specials from the Cafe at Rio. The celebration will be held April 23 from 11 a.m. - 1:30 p.m. in the RSC Tempe parking lot. Originally published in the April 20 edition of the Tempe Republic.